SaicleHome Water Bottle Reviews - What Is It And How Does It Work? SaicleHome Water Bottle Reviews – What Is It And How Does It Work? SaicleHome Water Bottle is an innovative product designed for use by people of both genders and of all ages. It’s a water carrier bottle that helps the user stay hydrated at all time and it can also help to keep medication in a convenient and an organized manner. This product is sold online and one can make purchase on amazon or on the company’s official website. It goes for $7.69, it’s said to have discount offers to those who buy in multiples and free domestic delivery. However, there are no details about return policy. What Are SaicleHome Water Bottle Claims? SaicleHome Water Bottle is a new carrier water bottle claimed to be made from eco-friendly material and it is free from BPA, thus making it safe for environment and human use. It comes with pill boxes that help to carry the medicine with you if necessary. This product is said to be good for outdoor camping or hiking, and it spry a good combination with drink. It comes in different colors according to the user preference, and it measures 23 by 7.5 by 7.5 cm. its claimed to have a gross weight of about 150 g and a capacity of about 600 ml. SaicleHome Water Bottle Review: How SaicleHome Water Bottle Works? This product is simple to use. The users are only required to add their favorite drink to this bottle, which is leak proof and can take a long to school, work or hiking activities. It carries a considerable amount that will help you to stay hydrated. 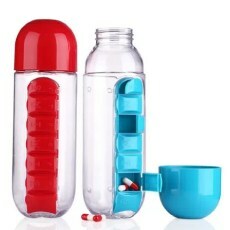 It has incorporated pill organizer that makes it easy for the users to keep their medicine conveniently organized. Users can fill in water; add some ice cubes to keep the water cold. This bottle can also help the user to carry their favorite drink such as sodas, coffee, fruit juice or tea along with them. This product comes in yellow, black, pink, red or turquoise color, which the user can choose from. It comes with seven pill boxes that help the user to carry medication with them, thus helping them to stay healthy. It’s made from reusable and environmental friendly material, thus helping to keep our environment healthy and tidy. It holds about 60ml of water, thus helping the user to stay hydrated for long. This product is produced by a well-known company in producing safe and eco-friendly carrier bottles. It has free domestic delivery and discount offers to those who buy in bulk. It comes with carrier boxes that help the user to carry the medications with him or her. It’s a water carrier bottle that carries about 600 ml, thus helping the user to stay hydrated. It can carry various drinks without having to worry about leakage. This water bottle can only be bought online and it’s illegible to international shipment. The manufacturer has not provided details about money back guarantee. This product is simple to use. All you are required to do is to feel the bottle with water or with your favorite beverage, close it tight and then you are free to go. There are no side effects due to the use or reusable and environmental friendly material when manufacturing this product. SaicleHome Water Bottle is a carrier product designed to help the user stay hydrated and healthy at all times. It comes with pill boxes, thus helping the user to carry the medicine in an organized and convenient manner, thus helping the user to stay healthy and hydrated. This bottle can hold about 600 ml of liquid, and it’s manufactured from NPA free plastic, thus making it to last for long and stain resistant. It comes along with weeklong pill organizer, thus making it easy for you to keep medications safely and in an organized form. The mouth of this bottle is made in such a way that it can fit ice cubes, thus enhancing carrying of cold drinks. This bottle has free domestic delivery and discount offers when bought in bulk. However, it’s illegible to international delivery and the manufacturer has not provided details about money back guarantee.